This post is not an artist’s statement of how I see my art in relation to my inner vision, etc., etc.. This is about my eyes, my left eye, to be precise. I was reading outside on the porch today. It was very bright. After I came in, the house was very dark, as expected. A bit later, I tried to read a bit at my desk in the studio. I noticed something most bizarre. There were serrated black lines disposed around an invisible arc. The space around each cross-hatched line was opaque. I could not read the words behind the lines. I did a couple of pencil sketches, trying to trace the black lines that appeared in my field of vision. But when I tried to focus on them, they disappeared. I tried a ‘blind sketch’, where I kept the black lines in my field of vision and sketched without looking at my pencil point. I took off my glasses and covered the affected eye. To my surprise, in the dark field, the black lines turned a bright orange yellow. I opened my right eye and could still see the bright yellow zig zags in my left eye. Below is my rendition of this disturbing visual phenomenon. 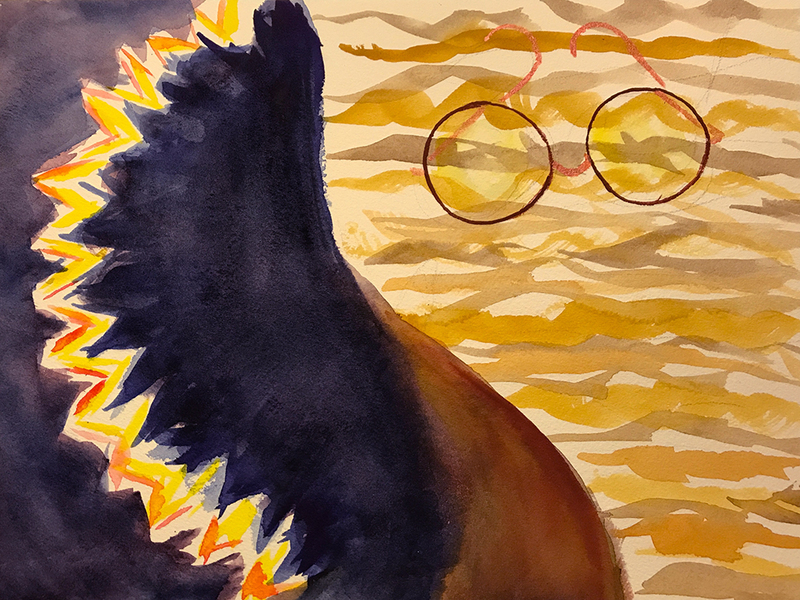 This entry was posted in Personal Stories and tagged artistic process, blind drawing, creative process, creativity, eye problems, sketching, visual arts, visual phenomena, watercolor. Bookmark the permalink. Yes, it was very strange, K. Thankfully it went away.